Bioglitter® requires the presence of microorganisms to degrade. Warm and wet conditions are ideal and higher concentrations of microbes will increase the rate of biodegradation. A good analogy is that a leaf in an arid environment will take longer to degrade than in a swamp. When tested to ISO14851 – Freshwater Biodegradability equivalent of waterways in the countryside such as streams, rivers and lakes. 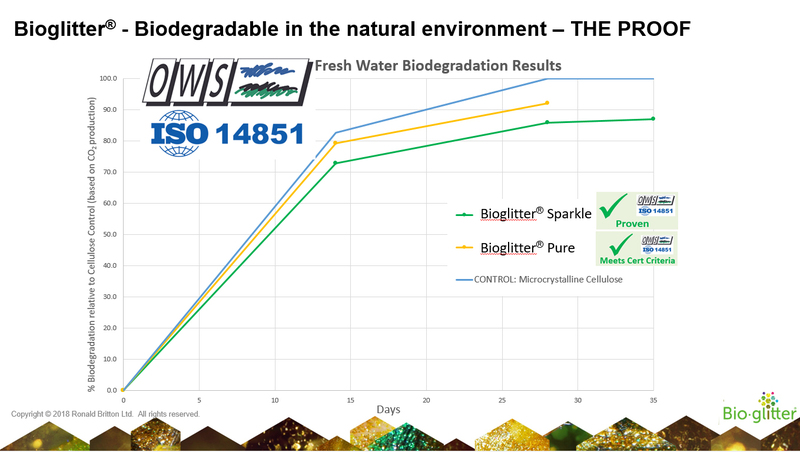 The vast majority of the biodegradable content in Bioglitter® Sparkle and Bioglitter® Pure biodegrades at ambient temperatures in only 4 weeks.